Beachy Head is the most famous part of the Eastbourne Downland. Beachy Head is the most famous part of the Eastbourne Downland. Beachy Head rises 162 metres (530 feet) above the sea below and is the highest chalk sea cliff in Britain. The main reason for Beachy Head's popularity is the wonderful panoramic view which can be seen from the cliff top. If you look east you see the beaches and town of Eastbourne, the Pier and the Harbour, and then on to Pevensey Bay and Hastings and, on an exceptionally clear day, Dungeness in Kent, nearly 40 miles away. The Royal Hippodrome opened in 1883 as the New Theatre Royal and Opera House. It changed to the Royal Hippodrome in 1904 following refurbishment. The Royal Hippodrome was the home of Music Hall in Eastbourne for many years and has the longest running summer show in Britain. 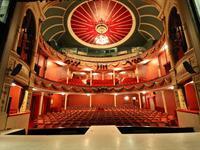 Originally named Theatre Royal and Opera House, this venue was a favourite of the future Edward VII. It was renamed The Royal Hippodrome when its productions changed to music hall and variety shows; performers then included Harry Houdini and Charlie Chaplin. The current foyer was remodelled in the 1930s but the auditorium, inspired by the Savoy Theatre in London, is original and retains a strong sense of this heritage. One of the South Coast's most historic landmarks, discover over 200 years of history at this Napoleonic Fortress, named one of the top ten military museums in the UK. Built to defend the South Coast from Napoleon's forces it still stands as a unique monument to that time and now houses the largest military collection of its kind in the south of England, along with a vibrant events programme. The current bandstand was built in 1935, with its unique semi-circular design and blue domed roof; there is no other like it in the United Kingdom. It has a main arena, middle and upper balconies and seats for 1,600. It has fast become the south coast’s most popular outdoor music venue, hosting something to suit all ages and tastes.